Today is an important day for one Indian boy, nine-year-old Narput Singh. 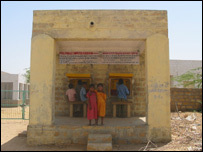 Something new is arriving in his remote village of Varna in the dusty, dry state of Rajasthan. Something he has never had a chance to see before - it is a computer. The digital divide seems at its greatest in India. On one side you have some of the most advanced work in IT taking place in cities like Bangalore or Delhi. On the other you have children who have little or no access to new technology and live in conditions where clean water and electricity are still luxuries. It is this divide that one man, Sugata Mitra, intends to bridge. He was first struck by it looking out of his office window. Inside his IT compound he could see the young techno-savvy professionals, belts hung with electronic gadgets. Beyond the perimeter fence, he could see the dispossessed children sleeping rough in a shanty town. He decided it was time to break a hole in the wall and give the children outside a chance to see what a computer was. He cut a hole and hooked one up. What happened next amazed him. They taught themselves how to use it. 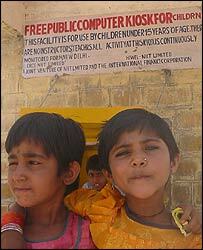 Sugata took his experiment further and set up computers amongst the underprivileged communities of Delhi. He built special kiosks where only children could reach the keyboard, and left them connected to the internet. In each case the results were the same. Without adult intervention, the children got to grips with the technology, even with their limited understanding of English. Sugata was able to make some important but controversial observations. "Groups of children given adequate digital resources can meet the objectives of primary education on their own - most of the objectives." In the thousands of small villages across the length and breadth of India, this clearly has enormous implications. 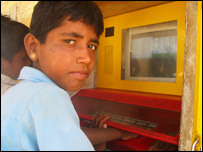 If the schools cannot provide access to both computers and trained teachers, then perhaps Sugata's approach could work. And for the children of Varna, the day has come. The Hole in the Wall project is to leave a computer in their village, and it will be up to Narput Singh and his friends to work out how to use it. The moment the box is open, the children swarm around it. They've never even seen the packaging before and some of them are rubbing bits of polystyrene on their arms, even trying a bite of it. Sugata gives a short talk before letting them loose. "Who can ride a bicycle?" he asks. Forty hands shoot up. "And who taught you?" There is some confusion and shaking of heads. "No-one taught you," he says. "It's a skill you can learn on your own." He turns to the computer behind him. "And the computer is like a bicycle." With the computer switched on, the children press all the keys and every mouse button. But Sugata has noticed a pattern emerging after the first initial chaos. "You find that the noise level begins to come down, and from somewhere a leader appears. "Often his face is not visible in the crowd, but he is controlling the mouse because suddenly you see the mouse begin to move in an orderly fashion. "And then suddenly a lot of children's voices will say 'Oh, that pointer can be moved!' And then you see the first click, which - believe it or not - happens within the first three minutes." Narput Singh has the mouse and takes control. And within three minutes he has clicked and, to his surprise and pleasure, inadvertently opened a game. He doesn't distinguish between educational games and those that are just for fun, and he is soon learning English words through a painting game with colours to fill in. Whilst he is picking up the use of the computer directly, others around him are absorbing what he does. For Sugata, it is this group learning which is significant. "We know that in nine months the entire group of children in a village would have reached approximately the level of an office secretary, which means they know dragging and dropping files, they know downloading, they can play video and audio and they can surf the internet". Not everyone is enthralled with Sugata's results. Tom Standage, technology editor of the Economist, is sceptical of such projects. He points out that Bill Gates chose not to drop computers across the developing world as part of aid packages, preferring to concentrate on medicines and other more practical help for poor communities. "Do you really want to have the maintenance of PCs in villages? Couldn't you have spent the money on a water pump? I'm not saying there's no benefit to it, but it may have been that the resources could have been used elsewhere in a way which helped more people." It costs Sugata about $1,900 for every computer put into a village, and he believes it is worth it. Most of the cost goes in maintenance as the technology has to withstand a tremendous pounding from the elements and the users. But, as the sun sets and the desert cools, Narput Singh is still engrossed, and will be for some hours to come. The adults of the village also welcome the new developments, believing it will offer their offspring much better chances than they have had themselves. "The internet is the future," says one elder, "and our children have dreams." Time will show whether the dreams are turned to dust in the desert, or whether the computer can make a lasting difference to these children's lives. Mark Rickards is a senior producer with BBC Radio 4. A Hole in the Wall (Part Two) is presented by BBC South Asia Correspondent Navdip Dhariwal, and was broadcast on 10 May at 1100 BST on BBC Radio 4.